Thanks for the video. Wish they showed more of the work behind the scenes than dancing but its still one I never saw before. 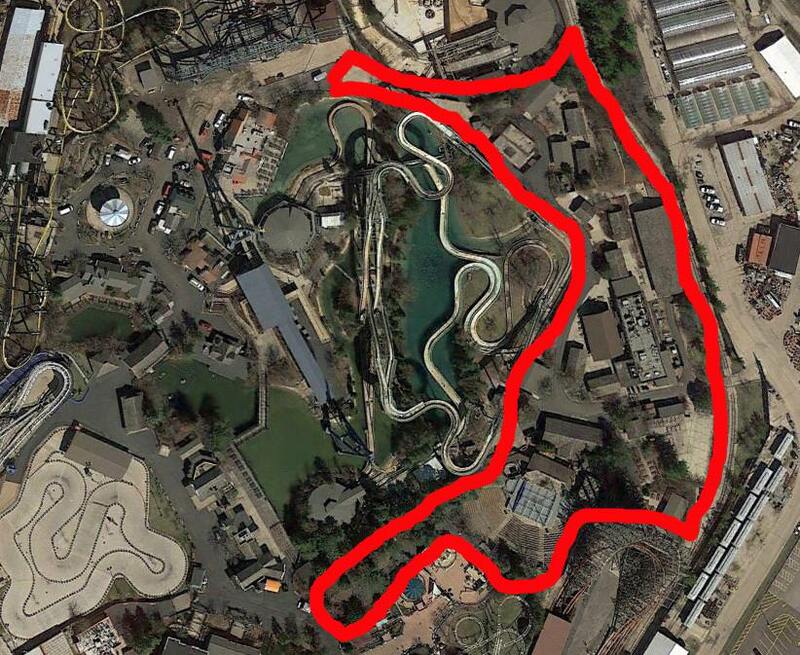 So I read about Six Flags Great Adventure's Holiday in the Park and wondered how can they have one and we can't? The average December temp in Illinois is 27, compared to New Jersey's average of 46. Our 8.2 Inches of snow versus a max of 5.4 inches recorded in New Jersey. Yes it's close to New York which is cold, but the climate is a little bit better. Does anyone know what land is SFGAm's property? Like what are the boundaries to build new rides? Also can they buy the land across Washington Street? So I tried going to SFGAM the weekend before they closed in November to reactivate my season pass for 2018, but they closed without notice right before we arrived after a two hour drive there. I had to call corporate to get an extension until the end of May since I couldn't make it back the next/last weekend. I figured I'd go to SFGAM in person in April when they open so they can process it like they said over the phone. However, I'm going to Texas next week last minute and I'd like to visit one of the parks there, but my pass on the app is showing as expired. Any idea what my options are? Also, I'd like to bring a friend from Texas to one of the Texas parks with me, but would I have any benefits/discounts for admission for her at those parks since my gold pass was purchased with SFGAM as my home park? Thanks for any help/advice!!! coasterjoy wrote: So I tried going to SFGAM the weekend before they closed in November to reactivate my season pass for 2018, but they closed without notice right before we arrived after a two hour drive there. I had to call corporate to get an extension until the end of May since I couldn't make it back the next/last weekend. I figured I'd go to SFGAM in person in April when they open so they can process it like they said over the phone. However, I'm going to Texas next week last minute and I'd like to visit one of the parks there, but my pass on the app is showing as expired. Any idea what my options are? Also, I'd like to bring a friend from Texas to one of the Texas parks with me, but would I have any benefits/discounts for admission for her at those parks since my gold pass was purchased with SFGAM as my home park? Thanks for any help/advice!!! I feel like the obvious answer is "call the park (or corporate)", because nobody else would be able to say anything for sure. While it is not possible to apply the cost of your 2018 Season Pass to a new Membership, we will for a limited time be able to offer you in-park spending credit equivalent to what you paid for your 2018 Season Passes in the form of "Six Flags Bucks." Six Flags Bucks can be used to purchase most things in the park including food, merchandise, etc. and will be valid for the rest of the 2018 season. Until April 17 or within the first 30 days following park opening this spring (whichever is later) we will give you full credit for your 2018 Season Pass purchase. After that we will pro-rate your credit based on the number of times you've visited during 2018. The functionality needed to give you credit for your switch to Membership will not be available until March 19. On/after March 19 please log in to your Season Pass portal and look for the "Upgrade" button for full details. Please note: you will need to know your season pass number, the name on each pass, and the purchase date to be able to claim your spending credit. If you’ve purchased a 2018 Season Dining Pass or 2018 THE FLASH Pass we will transfer these items from your 2018 Season Pass to your new Membership when you pick up your new Membership cards at the park. Corporate was really unhelpful to begin with lol thank you for you the idea and help! Did you find this information online?? Last edited by coasterjoy on March 21st, 2018, 7:47 pm, edited 1 time in total. I know this was asked long time ago...but bare with me...I forgot and it still puzzles me...why no mirrors in bathrooms? Is it a cleaning thing? That they have less to clean? People want to look at themselves in case they need to wash something off...were people vandalizing the mirrors? I think about this every single time I go in to one of the bathrooms. Okay so I was bored as hell and I started snooping around Six Flags annual reports, you know as you do, and there was something that caught my eye on the 2016 report. 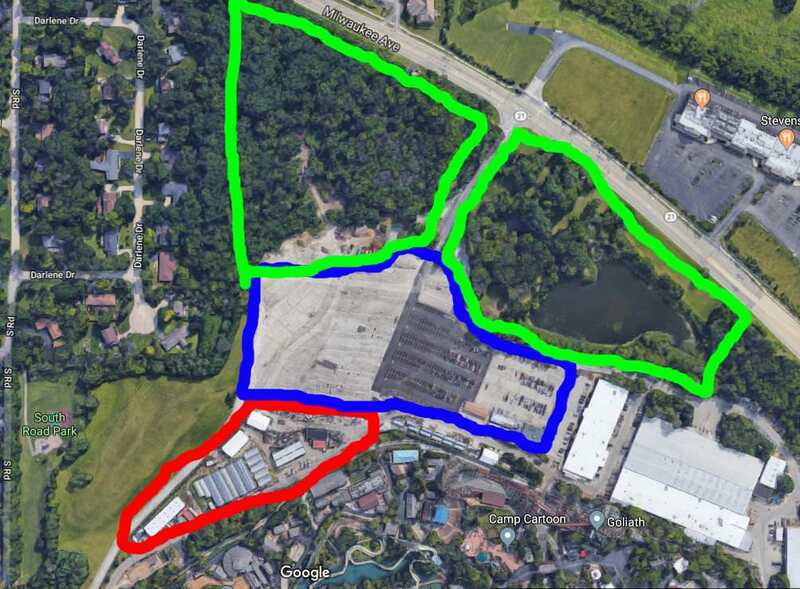 On Great America's description it said that there were 30 acres of potentially developable land. I was just wondering were or what that land would be. ^^ Hmm..interesting. Always heard how we are land locked and not much room for expansion. You are correct, but those can be replaced if they really want to. Even then, the greenhouses appear to be a bit farther back "behind" a supposed path, so I doubt it would even be necessary to remove them. I also want to emphasize that this is all pure speculative guessing. I have no proper backing on any of this, it's just a visualization of an idea I had. When did the park start randomly prohibiting fanny packs on rides? I did notice the sign on Joker but nobody remotely checked or paid attention if you were wearing it. Or (almost) any other ride I went on yesterday. On Mardi Gras Hangover, someones stuff fell out of his pants when he was upside down. Pockets are not secure. Fanny packs are. They can be zipped and are secure around your waist. When I went on Goliath, as the train was about to depart, the girl noticed my pack. She asked if that's what it was and said I cannot have it on. I had two phones inside. My wallet. Is she personally going to look after it while I am on the ride. Guarantee it will not be stolen? No, she won't. So I left. Did she really think I was gonna put it off to the side? I was too upset and looking back maybe I should have had a nice long conversation about it with her but oh well. Why is it not allowed on? Why do other rides not get checked? If it is a policy, enforce it on ALL rides. Not some. Pockets might as well be checked and everything forced out as they are not secure and cause actual problems with flying objects. Or hats and glasses? Secure hats and glasses? Yeah, right. I am not sure when this started but I have used a fanny pack for years and never had an issue. If you cannot personally have a staff member look after it to make sure it is not stolen, do not force me to leave it behind. I was by myself for that ride. I had nobody to leave it with. I already paid more for my ticket than in the past when I purchased a ticket at Jewel. I was not about to rent a locker (not even sure where they are) to store my stuff for one ride. onyxhotel08 wrote: When did the park start randomly prohibiting fanny packs on rides? It might very well be that the packs aren't safe with the lap restraints. I use a "Jogging Belt" instead of a fanny pack if I need to carry things with me. Its small and secure for things like my phone and cards. I make it a habit to only bring the essentials with me. My license/credit card/pass, keys, and phone. The keys get clipped to my belt loop and everything else goes in my front pocket or jogging belt. Im not sure what things you need to carry, but check out the jogging belt. Might work for you. I second the jogging belt. I wear it under my shirt so no one even knows you have it. Got it on amazon....there is a small separate compartment for your key and then your phone, money and cards fit in the rest. Works great! I NEVER had an issue before yesterday. It never would have even crossed my mind. Been doing it for years. It poses no threat that something will fall out. Pockets are always unreliable. We might as well force everyone to empty pockets too...and why do some check and some don't? A fanny pack is not going anywhere. Who came up with this? People can wear glasses and hats but not fanny packs which are actually secured to your body? I wear it around my waist and my shirt covers it. She noticed it as I was sitting down in the train. Had I caught it a second earlier, she would not have seen it. I wish I asked her how in the world does it pose any problem and if I leave it behind is she gonna keep it with her at all times....ridiculous. CoasterRiderSC wrote: This might seem like a really stupid question but would The Edge be considered a roller coaster? It's not on rcdb.com. It had a track, a train (with wheels I believe) and it utilized gravity. I only went on it 1x but it was a rush! This message is just to confirm receipt of the comment you recently left on the Six Flags Great America website about the park dress code. Your message is being forwarded to the appropriate department and you will be contacted as soon as possible (definitely within seven days, but usually much sooner). Thank you for your message, and have a great day! I was not allowed on Goliath yesterday with my fanny pack. I have worn it for years and none of the other ride ops have checked before. What is the reason behind this? You allow hats/glasses/pockets full of items that can fall but not a fanny pack that is secured to my body? I saw someones items fall out of his pockets yesterday...Why not force pockets to be emptied? Fanny packs pose no threat. They are completely secure. And if you enforce a rule/policy on one ride, make sure you enforce it on ALL rides. Prohibiting fanny packs but only telling guests "secure your hats and glasses" is contradictory. Pockets, hats and glasses pose the only threat for falling objects. We'll see what they say. Anyone do this before? Do they call or email? I'm just playing devil's advocate here with your e-mail. Your entire argument seems to be based on the possibility of items falling during a ride. Did you consider it's an issue of creating a gap between the rider and the restraint? If this premise is true, then there is no contradiction between securing loose articles and wearing a fanny pack as the loose articles don't pose the same threat of the restraint being as close to the rider as possible. Further, the park isn't telling you to secure the items in a fanny pack; they're telling you to secure them and it's up to you to do that in a way that is in accordance with the ride's rules (see quote below). I can already see the question: what's the difference between zipped pockets and a fanny pack? I suppose the response would be is that a fanny pack can be more of an obstruction to the restraint than a zippered pocket. "Loose articles are not permitted" on the following rides ( Batman: The Ride, Big Easy Balloons, Bouncer, Chubasco, Condor, Dare Devil Dive, Giant Drop, Goliath, Joker, King Chaos, Krazy Kars, Krazy Kups, Scooby Doo’s Mystery Machine, Raging Bull, Revolution, River Rocker, Spacely’s Sprocket Rockets, Superman: Ultimate Flight, Up Up, & Away, Vertical Velocity, X Flight, Zoom Jets) and should be left with non-riders or secured in lockers. Loose articles of any kind (including but not limited to purses, backpacks, beverage containers, cell phones and keys) may not be taken past the queue entrance and cannot be left on the load/unload platform. I agree with you that if the rule is no fanny/waist packs on certain rides, then it needs to be consistently enforced. And I totally empathize with your frustration on that! Having to wait in line the entire time only to be told "take it off" when you haven't had to do that before is frustrating. You had also mentioned you wished you asked the ride op to be personally responsible for your items. That goes well beyond the duties of the employee. Their job is to ensure the safety of the riders and the operation of the ride. Having to monitor everyone's belongings would compromise that. When I worked at the park (years and years ago) I had a number of guests ask me to keep an eye on their toys, keys, glasses, etc. I'd just say I can't and point to the sign about personal responsibility. I wouldn't remember who had what. My mind was focused on getting each train loaded, secured, and out. Again, just playing devil's advocate here. I’ve always noticed there’s a single brake (at least I think it’s a brake) on that short straight section before the figure eight on Raging Bull. So why is that break there? I am assuming it is just a trim brake to slow down trains that may be about to enter the figure eight section of the coaster too fast. Kind of like the trim brakes before and after the helix on American Eagle. I always thought it was there to make the drop following it (the one with the photo) more of a "surprise". The train isn't moving that fast to warrant a trim brake there but I'm not an engineer. I have definitely had rides on Bull where that trim brake was turned on. It serves a purpose if the train in absolutely hauling into that last section.